Yobit may normally barely be able to hold onto the #50 spot on Coin Market Cap, but someone over there must have cojones the size of coconuts. 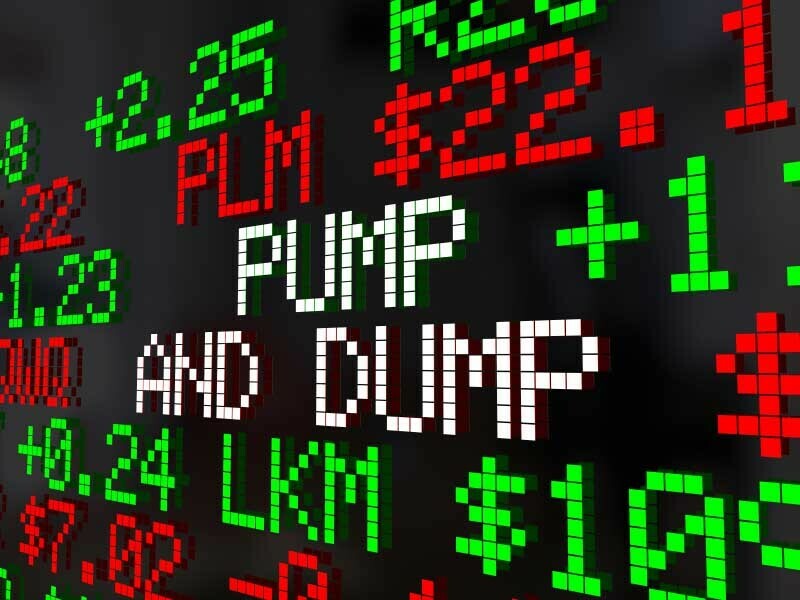 In an apparent effort to boost trading on the platform, the exchange is promoting its upcoming pump event – which is to be followed by the inevitable dump event. One of the downsides of a depressed cryptocurrency market is that trade volumes on crypto exchanges tend to decline right alongside coin prices. Exchanges are finding themselves looking for increasingly creative ways to boost trading on their platforms. Some exchanges have done away with trading fees, while others have hosted giveaways and exclusive airdrops to boost trading. Yobit, however, appears to have completely crossed over to the Dark Side. Earlier this morning, the crypto exchange announced through its official Twitter account that it would be launching a coin pump. That’s right. A cryptocurrency exchange is publicly acknowledging its intent to pump random coins. If my time zone conversions are correct, tomorrow morning at 9 am EST, Yobit will buy ten random coins – one every one to two minutes – for 1 BTC each. Marketing Gimmick or Market Manipulation? 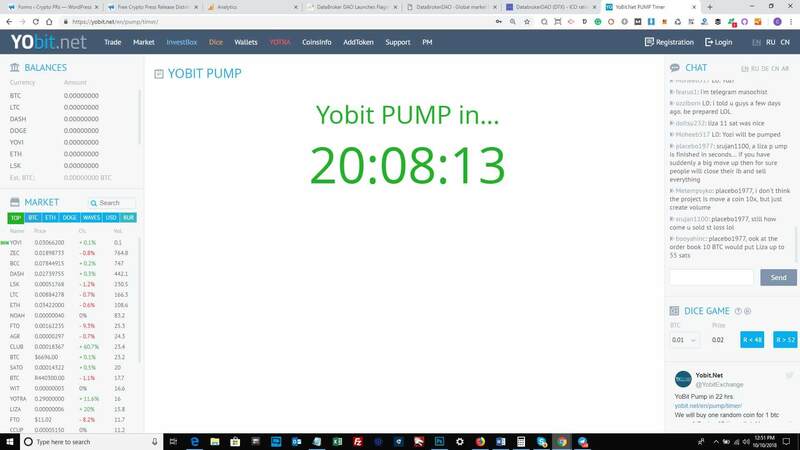 Yobit’s pump and dump event is no doubt a marketing gimmick designed to increase trading activity on the platform and, sadly, it appears to be working. In the time it took to write this article, the exchange jumped from barely holding onto the #50 spot to #46. Additionally, Yobit’s 24-hour trade volume has jumped by more than 60% – from around $17 million to over $28 million. Although the purpose of Yobit’s pump and dump isn’t specifically to manipulate the price of a single cryptocurrency (or group of cryptocurrencies), the end result is the same. Since nobody other than Yobit knows which coin is going to be pumped, traders are buying and selling random coins, resulting in price increases of as much as 200% or more. Once Yobit buys its 10 coins, those prices are going to plummet – possibly lower than they were before the pump began. Of course, crypto traders assume a certain level of risk when they buy and sell coins on an exchange, but what about the crypto projects themselves? Their coins are being artificially pumped, only to inevitably be slammed back down into the dirt. That’s another thing – how is Yobit choosing which coins it picks? Is it completely random or are crypto projects jockeying to have their coins selected? In one scenario, they are the victims, and in the other, they are actually complicit in the scheme. Unfortunately, due to the lack of cohesive regulation regarding crypto exchanges and the buying and selling of cryptocurrencies, Yobit’s scheme is most likely not technically illegal in some countries. It is most certainly unethical, however, and definitely shady AF. What do you think of Yobit’s pump and dump ‘event’? How far is too far when it comes to exchanges trying to garner new trade business? Let us know in the comments below.